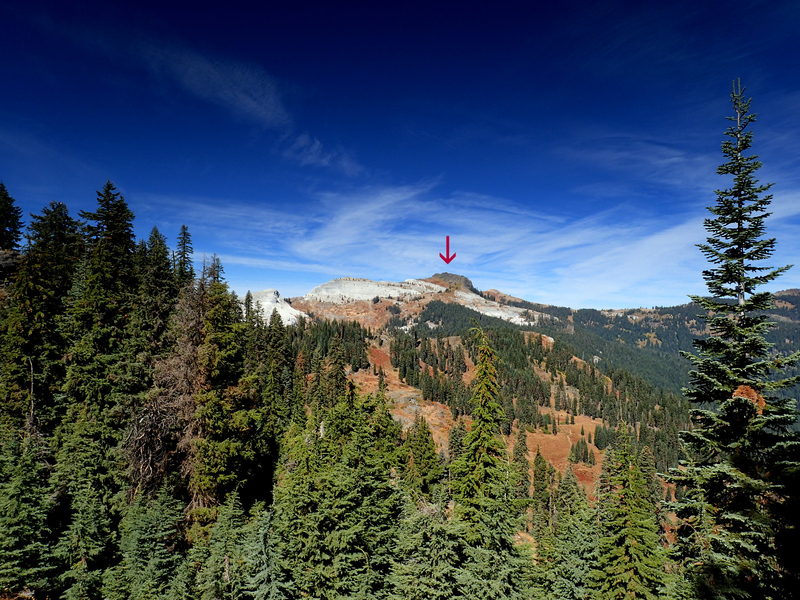 We made our first foray into the 225,114 acre Marble Mountain Wilderness (details) during the low (or no)-snow year of 2015 with an out-and-back hike to Marble Valley from Lovers Camp (post). 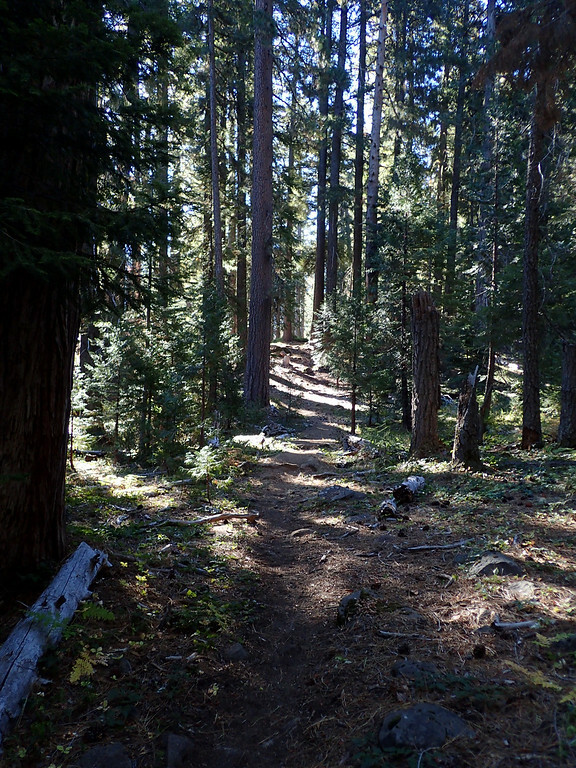 But then our local – an actually printed on paper – paper had a small article about a loop hike from Lovers Camp, up the Red Rock Valley, north along the Pacific Crest Trail (PCT), and then back via the Canyon Creek trail that looked interesting. And so it sat on our ever-lengthening to do list for more than a year. Now seemed like, with weather (rain, snow, cold!) predicted for the days ahead, the opportune moment to finally try this loop. Unfortunately, The LovedOne was sidelined by a utility inspection, so this one fell to me as another solo hike. 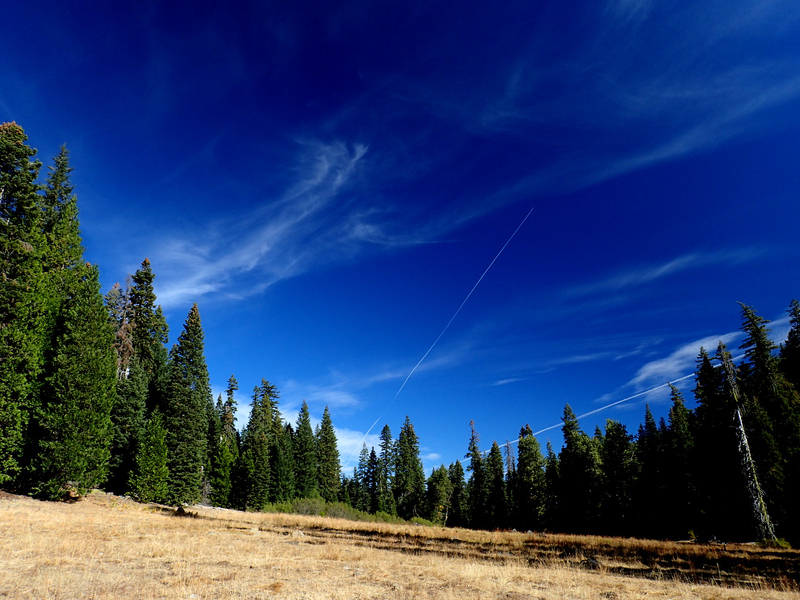 So, alone (sniff, sigh), I drove to the Lovers Camp trailhead outside Fort Jones, California. This is one trailhead that’s accessible all on paved road, but the last 7 miles is one lane and twisty – and is slow going if you get lodged behind a horse trailer or someone challenged by curves. However, once you finally get to it, there’s ample paved parking and a pit toilet. I started up the Red Rock Trail. Compared to the Canyon Creek Trail, which is a bit rocky and sharply steep in a few places, the Red Rock Trail provided for a well-graded, very pleasant climb up into the wilderness. After a few large switchbacks, it settled into a steady grade on a well defined, and completely clear, tread. 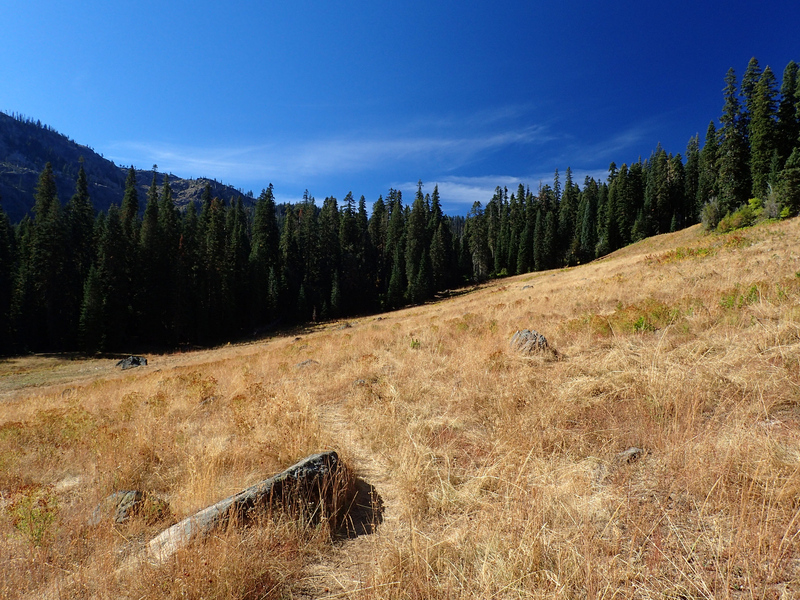 Once the trail turns into the Red Rock Creek drainage, it starts passing through a series of increasingly larger meadows, now golden at late season, with big views of the sky. 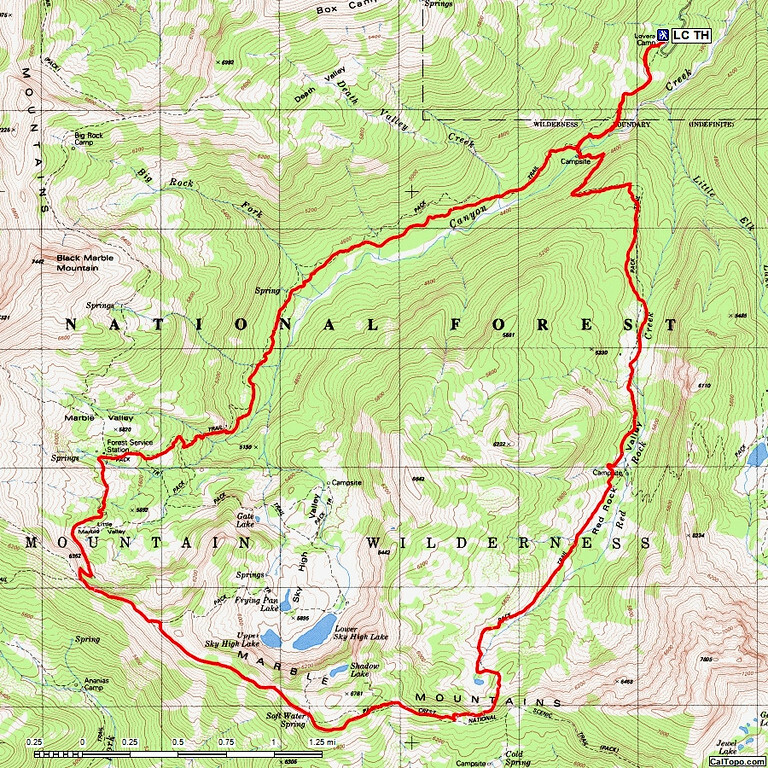 At about 3.5 miles from Lovers Camp, I passed the turn-off to the trail (USFS #5540) to Little Elk and Deep Lakes. 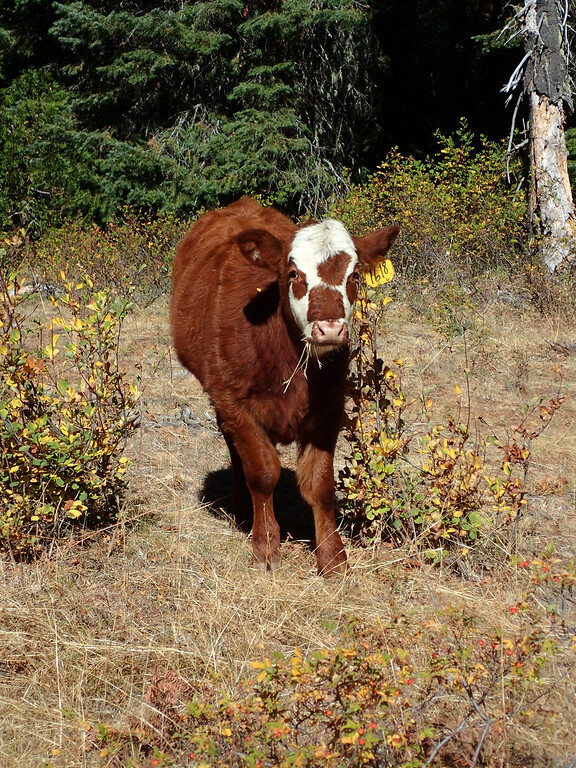 Per the Forest Service trail brochure …Cattle are often grazing the meadows… and, sure enough, there one was. The clanking of bells back in the forest indicated that this little McNugget wasn’t alone. Continued grazing in these valleys seems to have been a compromise necessary to have this area designated as a wilderness. 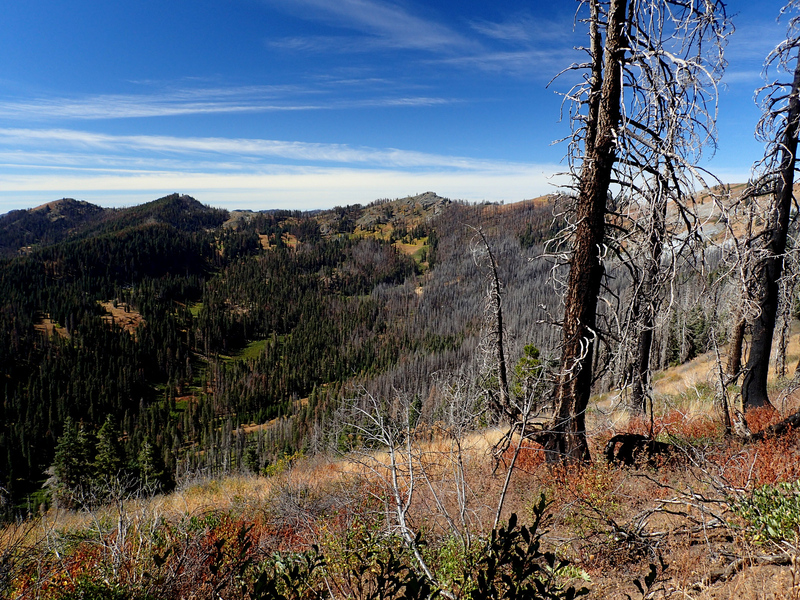 The same seems to hold true for several of the other wilderness areas in Northern California. before starting a gradual climb up above a small unnamed pond at the head of the valley. 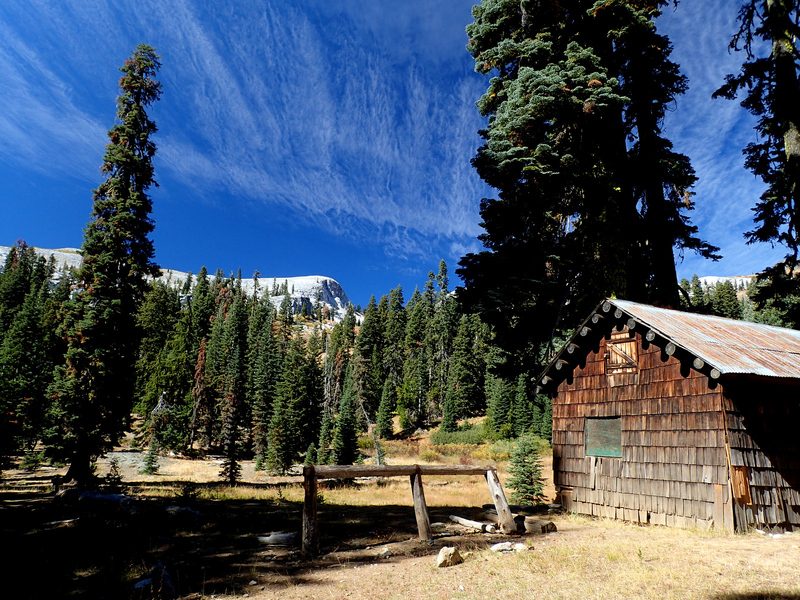 I came to the unsigned junction of the Red Rock Trail and the PCT, just across from a sign indicating “Cold Spring” in 0.4 miles – a campsite and possible water. 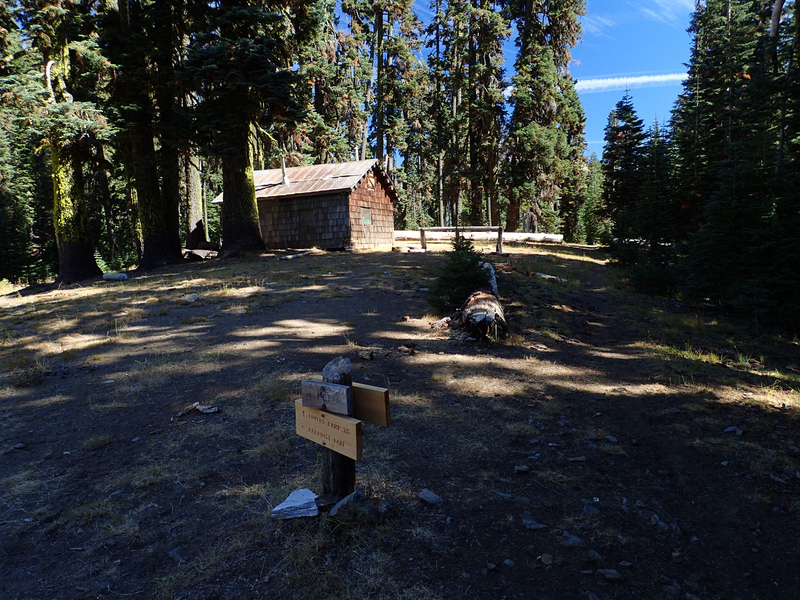 This junction is just about 5.5 miles from the trailhead. 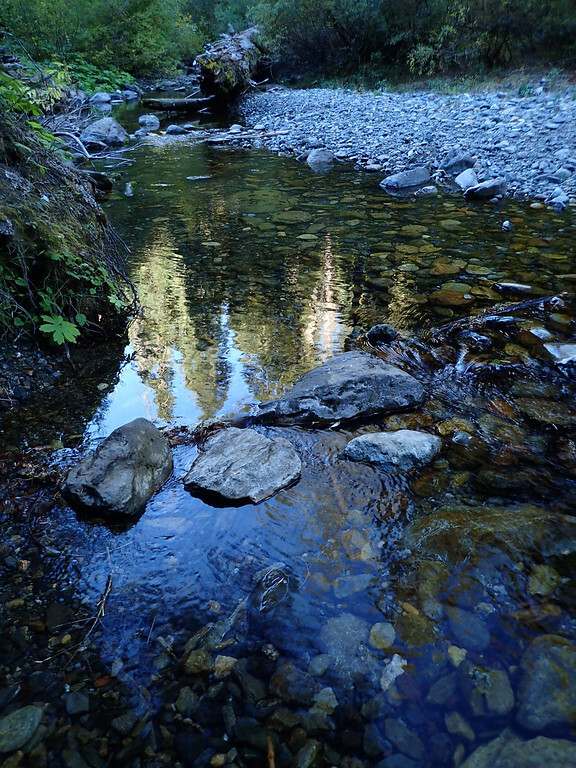 Now having reached the Marble Mountain crest via both the Canyon Creek and Red Rock trails, I have to say that the Red Rock trail is the mellower of the two – a steadier, less rocky, grade with more open views and a little pond to visit if you want. Of course, if you fear cows… From this junction, the grade of the PCT is largely level with views through 180º to the south, west, and north. 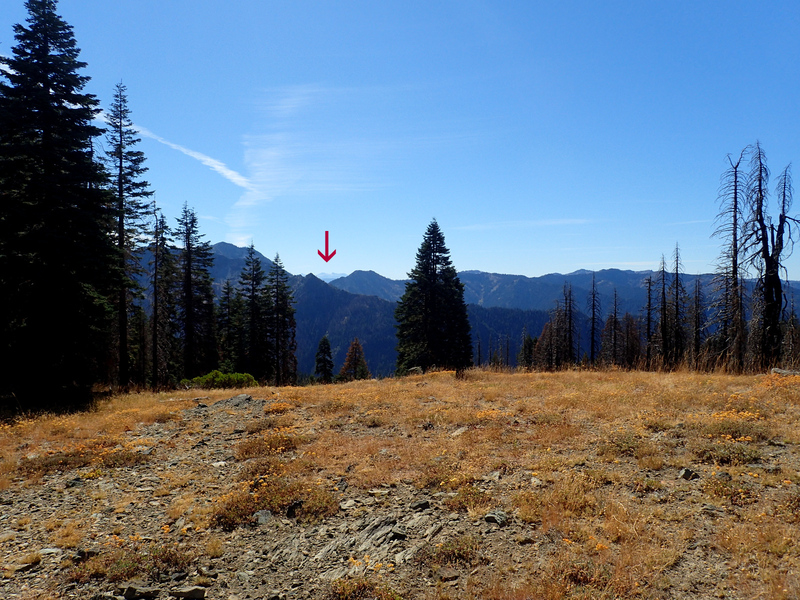 In 2014, the Happy Camp and July Complex fires burned to the west of here and pushed up to the PCT in this area. 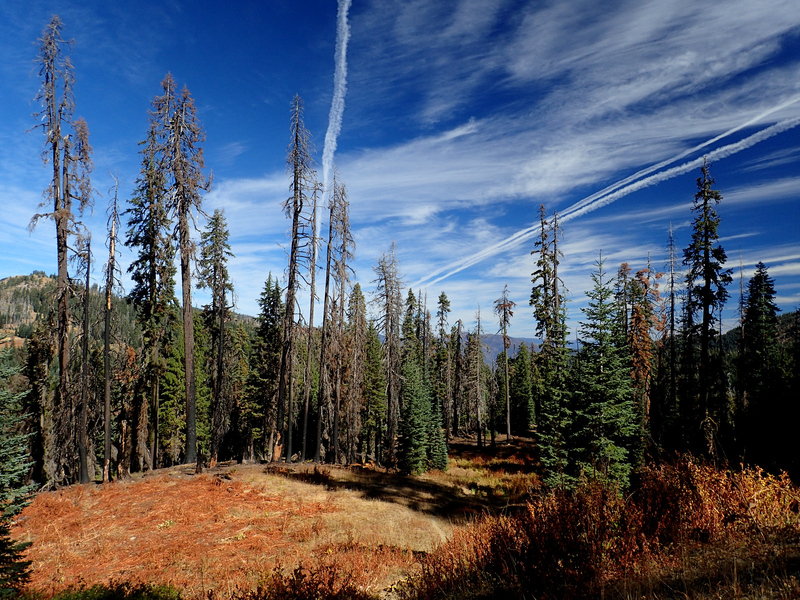 Looking to the northwest, I could see where the fires had encroached on Big Elk Lake in the Big Elk Creek drainage. But, on a happier note, this section of the PCT does provide some great views of Marble Mountain and the Marble Rim to the north. 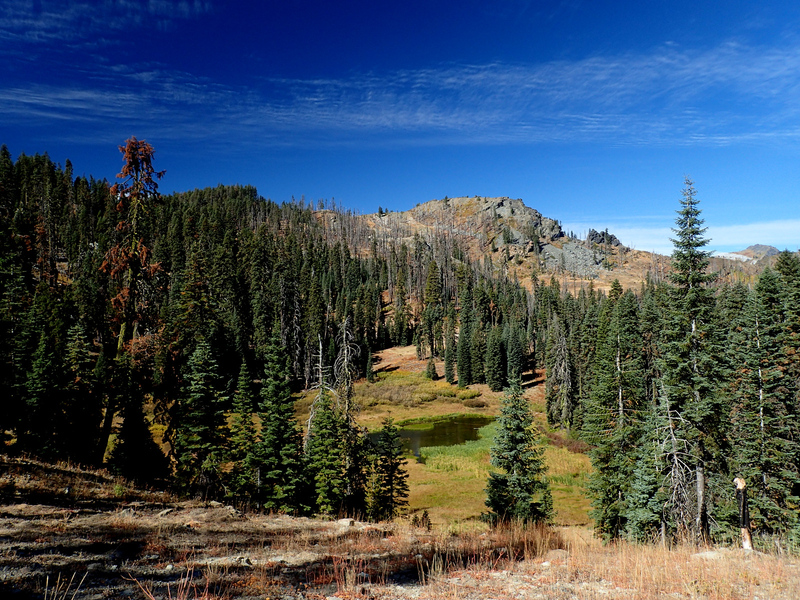 About a mile beyond the Red Rock / PCT trail junction, I passed the signed trail (there are actually two trails and you can loop the lake with them) to Shadow Lake, which sits at 6,450 feet and overlooks the Lower and Upper Sky High Lakes with a commanding view of the Marbles. It serves as a reflecting pool for the crags above it and the Marbles to the north from the proper angle. 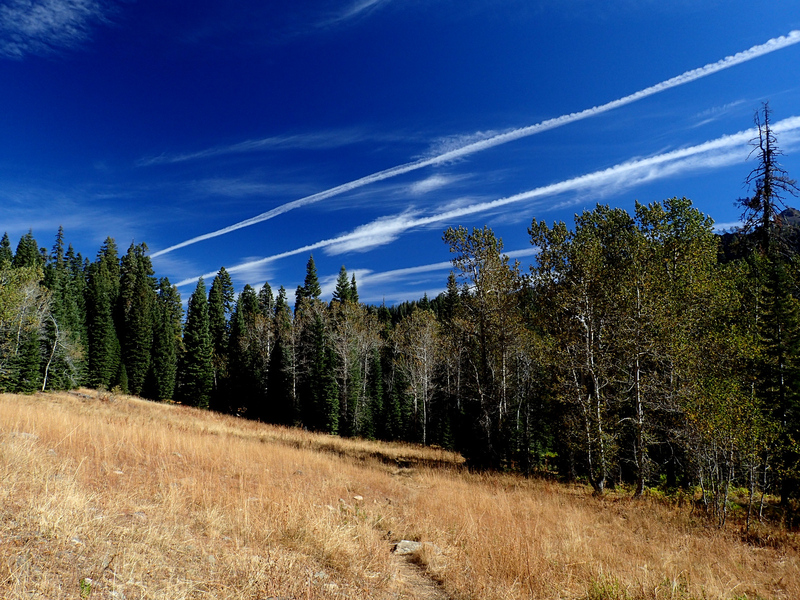 It has become a popular destination for day hikers and backpackers, and there are a few decent campsites here but no shade. But the stunning views of the scenery beyond and the Sky Lakes below have to be balanced against this area being pretty exposed to any incoming weather. Further north, just before the PCT drops off the crest down toward Marble Valley, there’s a short (50 yard) side trail up to the top of the ridge for one last, closer view of the Marble Rim. one with an amazing view of the Marble Rim looming above. 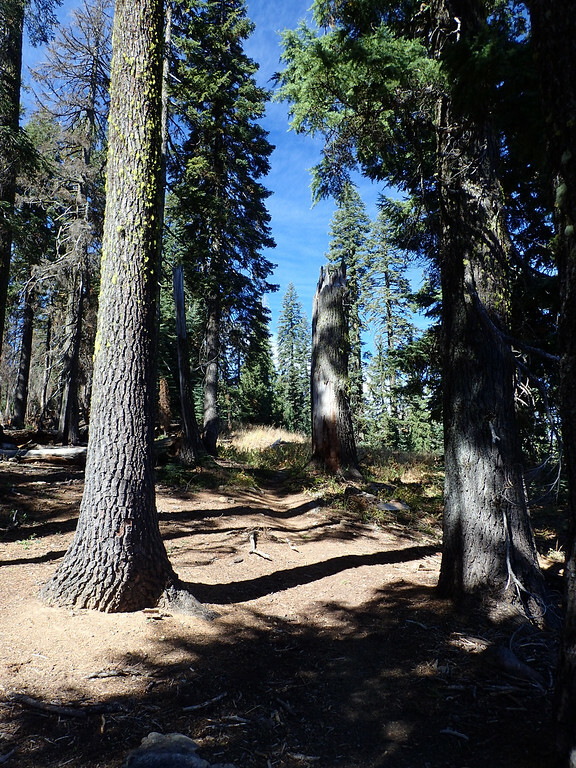 From the cabin, the return to Lovers Camp via the Canyon Creek Trail was all in the trees and somewhat anti-climatic after the big views from the PCT. 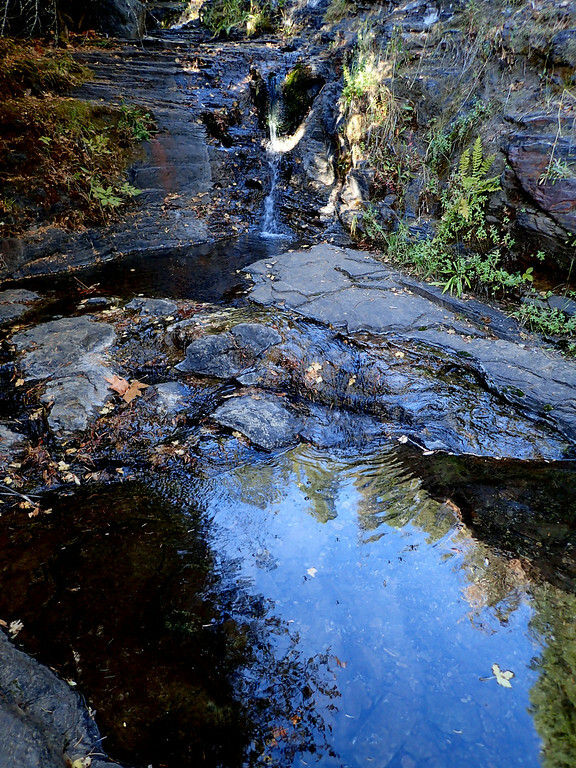 The Canyon Creek Trail does cross a small side stream which generates an impressive waterfall below the trail in early season but which is now just a trickle, as is the waterfall. 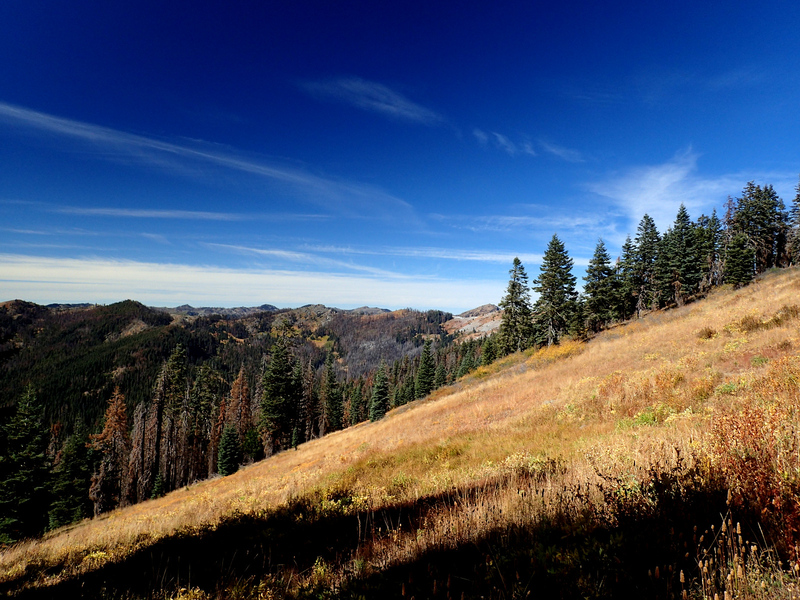 There can also be cows grazing in the Canyon Creek drainage but none were spotted this time around. 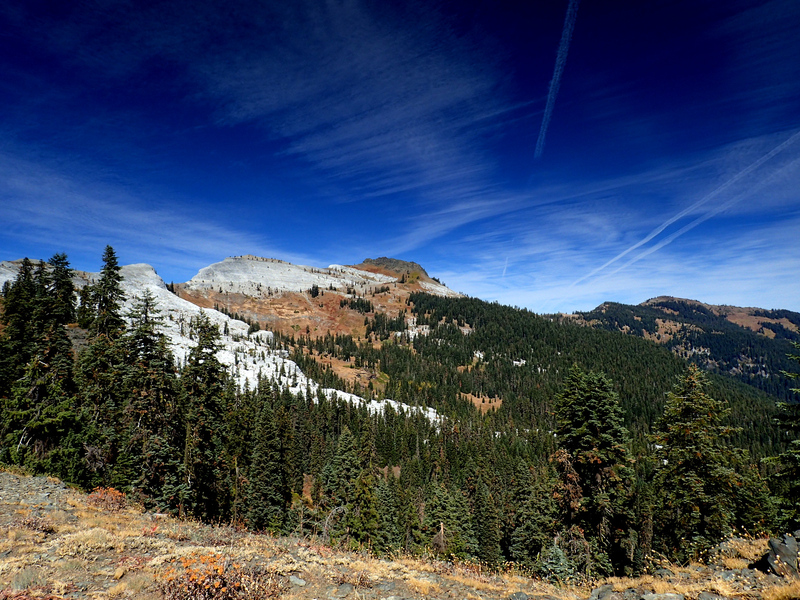 All in all, a good, moderate hike (13.3 miles round-trip; 2,400 feet of elevation gain), on an easy up trail culminating in big views on a bluebird perfect day (but with a dusting of snow expected in the next few days). Not much of a campsite at Cold Springs but delicious water! 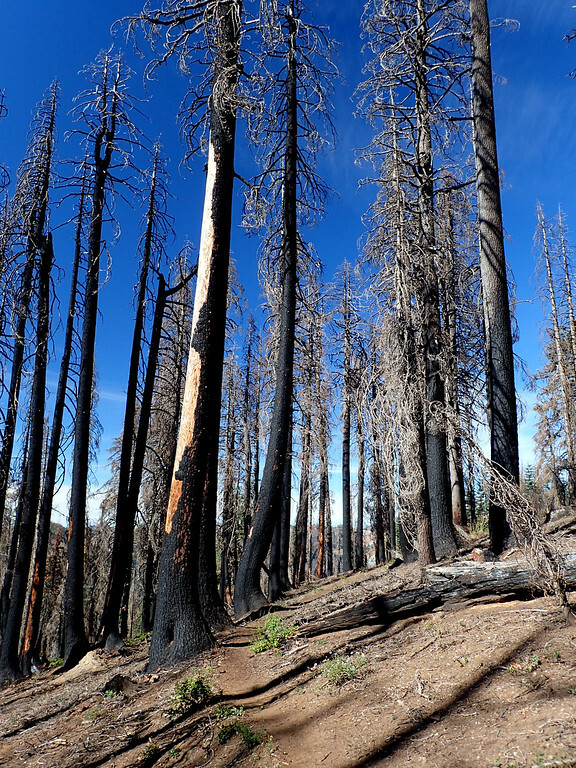 At least it had water – which is something nice to have along this piece of the PCT. A lot of folks seem to prefer camping at Shadow Lake instead. We really enjoyed that are when we were there in June. It was fun to see what it looks like this time of year. The now golden meadows are a big change from when you came through in June. I was hoping for Fall colors in the aspens but seem to have either missed those or they hadn’t started yet. Next year we might try a hike into the center of the Marbles – something different than these hikes in on just the east side.